Xero Projects vs Workflow Max – what’s missing? Xero has released an early version of Xero Projects, a lightweight project management module that businesses can buy with a Xero subscription. Xero also sells a heavier duty PM tool called WorkflowMax. Wondering what you will miss out on with Xero Projects? Here’s a list I have compiled from playing with the module and talking to Xero support. Given that this is a launch for Xero Projects, some of these may change as Xero improves features. If you see a must-have feature on this list then you should stick with WorkflowMax or similar software. Online retailers sometimes choose to run multiple e-commerce sites to cater for different audiences or provide a different experience. This is often the case with sports apparel retailers where one website is used for the season’s collection and a second one handles custom apparel orders for clubs and corporate clients. The custom apparel site usually allows for more flexibility around choosing fabrics, styles and placing own logos and names, and the sale process involves quoting, design review and custom manufacturing. If you are about to launch a second e-commerce website, here are some aspects to consider so that you end up with an ecosystem that works. This method will also avoid frustrations down the track. And that all these components are linked together. In a simple scenario you will build the new site on the same e-commerce platform that is already used for your retail site. In this case, check that your inventory system supports linking to multiple online stores and that it records the source of each order. For example, the DEAR inventory app supports linking to multiple Shopify stores to the same DEAR organisation. Not all integrations support multiple stores. Sometimes you choose a different e-commerce platform for specific features, for example, quoting for custom products. If you consider the sports club apparel scenario you may want to build a jersey design interface. A visitor could then choose a fabric, place logos and include individual player numbers and names on the back. Then the site would create a quote which they can come back to revisit before it turns into an actual order. If you are introducing a new e-commerce platform, check whether it has a built-in integration with the inventory and order handling system you use. Otherwise consider using alternative ways to send information between them. This could be via integration platforms such as Zapier, a custom integration, or a simple export/import process if you expect low volumes initially. You also need to consider other integrations such as accounting, marketing and CRM. If you can connect to each of these websites you need to avoid duplicating data or creating silos of data in your system. Sometimes you cannot avoid data silos but you want to know where they are and be comfortable with the implications. Not all integrations are the same. Each platform comes with different scope and options around the integration. For example, some create orders only, others handle payments as well. Some post each individual order and others support certain levels of batching. And please DON’T rely on the documentation provided by the software company. Run test transactions with different scenarios that are likely in your business. One scenario could be a new customer who pays immediately with shipping and a promo code added to the cart. Did the the e-commerce app deduct the inventory properly from the inventory app? Did it create an invoice in the accounting app for the correct amount with the appropriate tax code? Has the discount come across as a discount on the invoice line or as a separate negative line? Try the different payment options on the site. If you provide options for credit card, Paypal and maybe AfterPay, see that the payments flow through to your accounting software with all the relevant information to simplify reconciliation. If some of the data does not come across the way you expected it, consider whether this is still workable for you or if workarounds or custom integration are required. Now that you have two websites, you can end up with two customer databases. This will inevitably affect your interaction with your audience. Do you plan to send out promotions to both sets of customers? What happens if one customer is on both lists? The key question you need to answer is, do your customers feel like they are dealing with a single business or with two separate businesses? For example, do they need to sign up separately for email newsletters from each site? Do they expect their settings such as special discounts and payment terms to carry across to the new site? Make sure the setup and integrations will give your customers the experience they expect from you. If both websites are going to integrate with the same inventory app, consider how this should be set up. Will the sites share the same product list or separate lists? Decide which system will be the product master. If you don’t decide which system is master, you may find yourself adding products to one site and then these products suddenly show up on the other site. Typically each site will promote different products. In the above case, one site is selling retail sport apparel and the other targets customised apparel for sports clubs. You may want to promote some products on both sites. For example, you may add stock products like socks, water bottles, bags, or other non-customised garments as add-ons to a customised club order. To make this work check how you will control parameters for each site, such as different pricing or different minimum quantities. If you don’t want your two sites competing for stock, you may need to set up separate warehouses so each site has separate stock guaranteed to it. Consider your reporting needs. Now that your data will be spread across multiple databases, you may want to run reports across the databases or separately. If both websites sync their customers and sales into the one inventory app you may need some of way of tagging orders to identify which site made the sale. This is important if you will want to run reports separately. If you want to gain business insights across the business, consider syncing all the information into a reporting dashboard. Then you won’t find yourself wasting time on merging data to see a report. You don’t want a situation where it’s too much bother to create reports. User experience has become so important to online stores that it makes sense to have two websites for two different types of customers. But you need to plan these projects carefully so that you don’t mess up your customer experience or your back office along the way. If you need assistance in planning a good ecosystem with multiple websites please get in touch. Plenty of smart businesses are building great operational systems using the latest cloud apps. But it can become very difficult to see information about your business when it is contained within multiple interfaces. How can you analyse the information hiding inside? The good news is that with most cloud apps, you actually can. With a little work you can have all the data you need to run your operations in one screen. They used to be called reporting tools. Now they are called business intelligence services or BI tools. They are simply databases with interactive tools to prepare charts and tables, clickable drill-down menus and exports. Very much like Microsoft Excel spreadsheets but online, and where the data can be stored in tables linked to each other. When you link tables it shows you the relationship between the information. For example, linking invoices to a job or timesheets to a staff member. This lets you ask more detailed questions and get very useful answers. For example, you may see that 50% of your income came from compliance work, 40% from advisory work, and 30% from one off projects. Up 15% from the same month last year. Interesting. Then, you could drill in to make sense of a figure. Like clicking that bar that shows $27,000 of non-billable work, to find that 60% of it comes from one of your teams (are they entering their timesheets wrong?). Or that the $27,000 is disproportionately related to a certain client group (are some of the tasks are misclassified in the job setup?). When you get excited, you may want to export all the costs and timesheets related to a certain department and have a field day with them in Excel. You may realise your team sometimes forget to mark jobs as completed which delays invoicing. You could add an automated weekly report highlighting jobs with billable time that have not been invoiced for more than 14 days. These are some of the typical ways businesses use of these nifty online BI tools. View, drill down, identify, figure out, make informed decisions. You may be thinking, I love playing around in Excel like the next guy, but my job management app doesn’t let me extract all the data for reporting and querying like this. Or maybe you have sent a request for a particular report and received the all too typical ‘we love your feature request, we will forward it to the development team, vote for it here’. And then what? You can sit and wait for them to develop what you need or you could just make things happen now. How? You just need to connect your cloud systems to a BI tool, and voila! All your data is reportable, exportable and playable to your delight. Sounds techy – can I do it myself? Depends. Some systems have a pre-built link to BI tools. Like Xero and QuickBooks Online do with Microsoft’s Power BI and Zoho Reports. With these, the setup is relatively straight-forward. You may want to get a technical person to help you configure it at first. Other systems will most likely need someone to develop the link for you. The link is a small program that pulls the data from the cloud app and pushes it into the BI tool. Then you can can prepare your dashboards, reports, drill downs, queries and exports to your heart’s content. In this series of articles I will share with you stories of Australian businesses that use this type of technology. I will tell you about their wins and the technology they used. And of course, I will tell you about some of the hurdles and limitations. Just to keep it real. Not sure whether a small business accounting app like Xero is big enough for your business (or your client’s)? With a little lateral thinking you can avoid moving to an expensive ERP. Every app has its limitations and Xero is no exception. There is the publicised limit of 200 employees and lesser known soft limits on invoices, bills and transactions. These numbers are more important to selecting accounting software than the actual revenue of the business. Take a real estate agent on $1 million a year. She could make that target with just 10 sales a month. To hit the same target, an online retailer could crank over 2,000 sales a month of low-value items, such as stamps or cards. Small business accounting software cares less about the size of the deals than the number of them. This is because the database behind the software needs much more processing power to cope with 2,000 sales a month than it does for 10. Accordingly, accounting software vendors place limits on the number of transactions they can handle. Xero provides the following guidelines, as of November 2016 (they are likely to change). These are not hard limits and they are not part of your licence agreement; the software will work just fine if you exceed them occasionally. But if you significantly exceed them on a regular basis the software will take longer to load each page. In extreme cases, parts of the program will just stop working. Does this mean that you have to plan your migration out of Xero? Or avoid using it for a business that plans on healthy growth? Not necessarily. In many cases, creative thinking and rearranging your systems’ architecture are all that’s needed to stick with your cloud accounting system of choice. Here are a few tips that we often suggest to consider when evaluating a performance-compromised cloud ecosystem. Tip #1. Can you batch? If your transactions are coming from a point of sale or an inventory software, ask the vendor if it can batch the transactions. Marianne, an online retailer of imported foods, was unable to run the general ledger report to send to her accountant. Xero would think forever and then time out. She tried on different machines and at various times of day. Eventually, we had to run it on a quarterly basis and ask the accountant to add everything together. Then we looked at her data in Vend, her point-of-sale app. Vend was sending an average of 70 invoices a month for two outlets and a handful of wholesale customers. The number of invoices clearly wasn’t the source of the performance issue. Then we realised that each invoice carried on average a hundred items. In this financial year, she was averaging 7,000 invoice lines per month! We changed Vend from posting a line per product to a line per income account. The monthly average is now down to under 600 invoice lines per month. And Xero is back to being fast and efficient. Many other systems can batch transactions. Cin7 can batch POS transactions on a daily basis and send wholesale orders individually. Neto eCommerce also has a variety of batching options. Aren’t we missing out on important information? Not usually. In most cases, order fulfilment is done in the ecommerce system and individual orders are not needed in Xero. In fact, it is much easier to handle reconciliation in Xero when a single daily transaction comes in and matches the merchant account settlement for online cash clients. Tip #2. Can you consolidate? John, a wholesaler of lifestyle goods, is using Magento for eCommerce, Unleashed for inventory and Xero in his import business. John and his bookkeeper were excited to use Xero for the first three years until John’s online sales started to pick up. A multitude of small transactions coming into Xero through Unleashed every day began to slow the system. Alarmingly, the BAS report stopped working entirely. You guessed it; Xero would think forever and then time out. Xero Support offered to process the BAS report and send it on to the bookkeeper – for a while. Eventually, Xero advised John that he would have to find another solution. 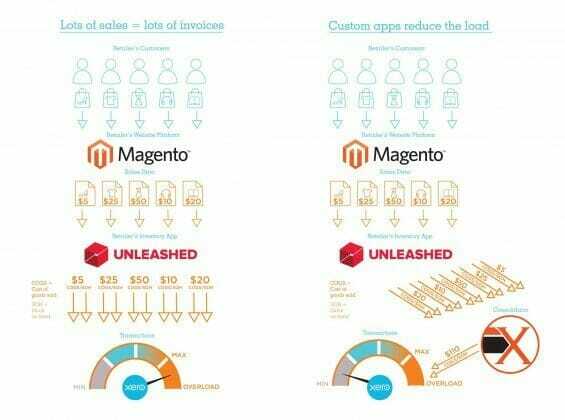 The option of disconnecting Magento and handling online sales manually seemed daunting. There had to be a better way. Finally, we decided to consolidate the data within Xero. A quick chat to Xero confirmed that if we removed the multitude of transactions every day and replaced them with a summarised transaction, the performance issue would disappear. A couple of weeks later the Xero Consolidator was up and running. A wicked nightly process goes into Xero every night, identifies all the web orders, removes them and enters a single order with lines totalled by income account. John’s bookkeeper is happy because reconciliation is now much easier. All the online sales that were cash transactions and paid in bulk through the merchant settlement were consolidated. And the BAS report was back to running instantaneously. If you are using Xero to bill for a subscription-based business it might be time to graduate to a purpose-built billing engine such as Chargify. Let it handle the heavy lifting of billing and leave Xero to handle just the accounting. Chargify and the like also give you the added benefits of automated pro-rata billing, handling cancellations and even service provisioning based on paid/non-paid subscriptions. It will leave Xero to do what it does best – bank reconciliation, GST accounting, payables and payroll. Billing engine providers are usually very helpful in moving you across from your accounting app to their billing systems. Helen, a business owner with an online directory for health providers, decided to build her own billing engine. This engine managed users’ access to the directory and recorded the invoices in Xero. As the number of invoices began to cripple Xero, we redesigned her integration and instructed her developers to post totals to Xero instead. This simple solution only works for cash clients. It gets more interesting when you need to track debtors. Sometimes it’s worth replacing the out-of-the-box integration between your trading system and your accounting system. If both systems have good APIs (or software connectors), it is usually possible for a custom-built process to retrieve information from the trading system, batch it in an interim database and then push it to the accounting system. In this case, you would turn off the relevant parts of the built-in integration or turn it off altogether. The API economy rewards software vendors for opening up their applications so they can connect to other programs. It makes it easier than ever for business owners to structure the flow of data between software solutions in the way that best works for them.